Important note! 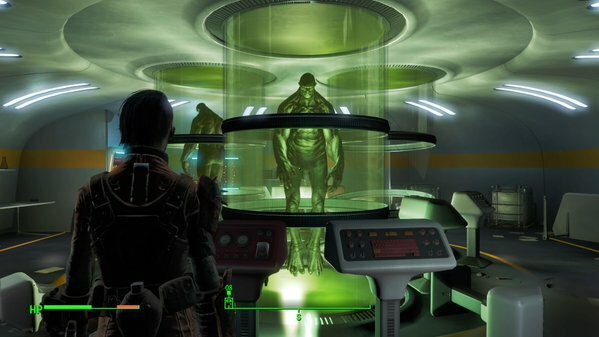 This mission is the final step in Fallout 4, and if you complete it you’ll wipe out the Institute as a faction. If you’re not done completing missions for the Institute, do not engage in this quest. The three non-Institute factions - Minutemen, Brotherhood of Steel, and Railroad - all have their own versions of this quest, though they narrow and become roughly the same by the end. The Minutemen are a bit unique in that they reach this quest without having to burn bridges with anyone, but The Nuclear Option will seal the deal once you get started. The Minutemen version is also quite a bit longer, as their method of infiltration is... not quite as straightforward. - Once Defend the Castle is over, speak to Preston. He’ll give you a lowdown on what needs to happen to attack the Institute. Zip over to Sturges to finalize your preparations. He’ll give you the Institute Relay Targeting Sequence, as well as instructions on how to get in. - The entrance to the Institute is a pipe located in the river to the east of Greenetech Genetics. Go past the building to the shoreline, look for a small dock, and jump in. The pipe is built into the wall here, hidden behind some orange seaweed. Rely on your area map to figure out where this is - looking at the world map will give you a confusing waypoint to work with. Rad-Xs or a Hazmat Suit will protect you from Rad exposure along the way. The location of the pipe to the Public Works Maintenance Area. I was pretty much standing on top of the pipe in this screenshot. - … and there will be Turrets on the ceiling in the southern hallway, where you need to go. Take them out, then continue past to find another pipe on your right. The pipe leads to a hatch, and the hatch to a maintenance room. You’ll find an Armor Workbench on the upper floor, as well as a door into more sewers. Yay. - Get back down into the water. You’ll run into a Mole Rat down here, and shortly after that you’ll start hitting some intense radioactive activity. Either throw on a Hazmat Suit or be prepared to down lots of RadAways. Once you find dry land on your right you’ll also start running into Ghouls, and they’ll rise up on all sides of you. Stealth really helps avoid a pile-up here, as does not pushing forward too violently, and too quickly. - Shortly after the last of the Ghouls you’ll hit an intersection, and if you turn right there will be a Turret on the ceiling. This is a sign that you’re about to hit Synth territory, as there’s a catwalk just behind the Turret, and if you move quietly you can hear - and see - Synths in an adjacent room, through a crack in the masonry. If you can hack the Expert terminal here you can dip into this room early; otherwise you’ll have to continue past, looking for a hole in the wall on your left. Watch out for another ceiling Turret. - We’ll assume you had to go through the hole. It leads into another maintenance area, and from here you can find a door into a larger, better-lit room. There are two Synths on a lower level to your left. Also on your left is an Expert terminal that will open a small storage area packed with goodies. 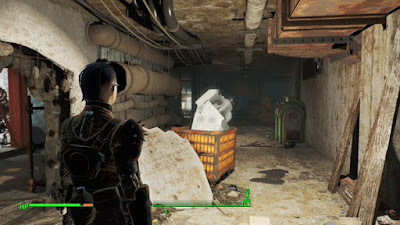 There Animal’s Test Logs Holotape is in the central terminal in this room, and you’ll find the loot-packed remains of an Assaultron on the lower level, as well as a Weapons Workbench. - If you head north from this room you’ll find a hallway with an office (look for a wall safe inside) and a stalled elevator containing some ammo. Overall, a dead end. If you make your way through the western hallways from this room (watch out for a Turret along the way) you’ll find more maintenance areas with lots of items, including a Fusion Core inside an Expert locked cage, a Power Armor Station, and the other side of the security door you presumably couldn’t open earlier. Check near the door for a Stealth Boy. In the final room in the west, along with the two Synths you may have already shot, you’ll find an open pipe; hop into the water and take a left. - You’ll emerge in the room with the teleportation pad, as before. 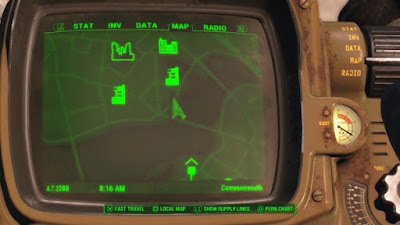 Use the computer console in front of the pad to load the Institute Relay Targeting Sequence, then initiate the sequence to bring a bunch of Minutemen in. At this point the quest joins up with that of the other factions. The Railroad's path into the Institute is significantly easier than the Minutemen, though it has one extra step. Jump to the Institute and speak to Z1-14 by the Relay. Once you've confirmed that everything's ready, kill everybody in the Relay room (Synths and Scientists alike), then give Z1 a moment to bring the Railroad in. but I think the room looks cool. - At this point the three quests join up, and the remainder of your progression will be roughly the same. Talk to Preston / Elder Maxson / Desdemona and he / she’ll give you a Fusion Pulse Charge for the final leg of your mission. - The next area, Old Robotics, is basically an enormous shooting gallery. You need to make your way to the lowest floor while blowing through wave after wave of Synth, backed up by Turrets. There are terminals along the way that can deactivate the Turrets if you’re up to Advanced hacks (pretty sure that’s what they’re for, anyway), and if you make it to the bottom level without causing much of a ruckus (tough with a team of NPCs at your back) you can activate a Sentry Bot in the next room over to wipe out a bunch of Synths for you. You’ll have to destroy or deactivate it to continue, however. - A Hatch in the next room over from the Sentry Boy will lead you to a Fusion Core, as well as a series of tunnels. Beyond is Institute Bioscience, and you’ll emerge in a shabby-looking room you may have seen while exploring the Institute earlier. Soon you’ll find the main area of Bioscience, and you’ll have a few moments to pick Turrets off of the walls before Synths start to swarm in. Another firefight ensues. Stay near the entrance, as someone ‘mongst the bad guys will release the Gorillas from their displays in here, and the big louts will charge you if you get close. - From here you’ll wind up in the hub of the Institute. The fighting gets really intense here, as you need to face off against not only normal Synths, but Coursers with Stealth Boys. You’ll wind up pinned during the first part of this fight, so hold back, let the NPCs engage the enemy, and help from a distance. Keep moving and ducking behind objects to avoid Courser salvos. Once you can move more freely, spread out and help your buddies finish off the remaining Synths. So long as you don’t try to bite off too much at once you can win this battle… it’ll just take a while. - Once the last of the Synths are gone Sturges / Ingram / Tom will speak up. Hop onto the central elevator and ride it to Father’s quarters. He’ll be in here - assuming you didn’t murder him to get the Institute irritated at you, like me! - and, after a scene, you can access his terminal on the second floor. Here you can not only override the locks on the doors in the hub area, but you can engage the optional evacuation order to get the scientists of the Institute out of the building. If you're convincing enough (and, you know, if he's even here) you can get Father to supply you with a code that will shut down some of the Synths ahead, making your job a bit easier. - There are plenty more Synths running around now, but you can ignore them if you wish. Head to Institute Advance Systems, in the north, and run straight through to the opposite end of the entrance. 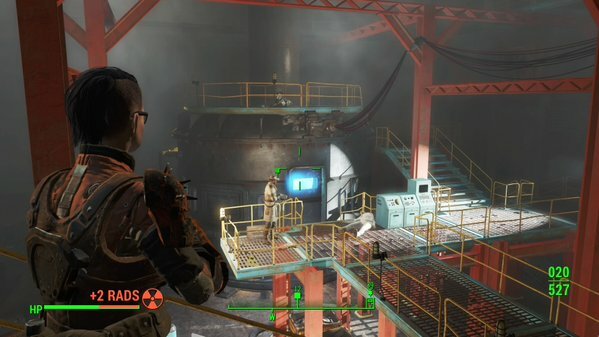 A previously blocked door is now open, and it leads to the Institute Reactor. Charge through; the Synths from this area won’t follow. The Institute Reactor in Fallout 4. If you can clear this room, you're home free. - The first curved hallway on your right is filled with Turrets. Taken ‘em out and you’ll find the way to a small maintenance room. Preston will pause in here for a quick talk; once he’s done, pop open the double doors on the other side of the room. - Down a flight of stairs you’ll find the reactor room, and it’s brimming with Synths, including two high-class, named Synths with Legendary status. The one on the ground has a Flamer; the one on the upper catwalks has a Missile Launcher. Throw in Turrets and you’ve got a rather hideous setup. Stay back in the antechamber to this large room and shoot through the windows / door while Preston (and, hopefully, your companion) engage the Synths from outside. So long as you don’t get caught right in the middle of the crossfire you should be fine. Everybody in here has some nice loot, but the named Synth on the ground floor (Z4K-97B) carries a Reactor Terminal Password you need. - … and you’ll find a certain youthful Synth waiting for you. If you wish you can opt to bring him along with you, in which case he’ll become a Settler in one of your settlements. (Speak to him after everything’s done and he’ll give you a special Holotape, assuming you permit him to join you.) Either way, speak to Sturges / Ingram / Tom when you’re ready to leave, then step into the teleporter room again. - Once you’re in place, well, you’ll know what to do. Talk to Preston / Elder Maxson / Desdemona after it’s done to complete the mission.